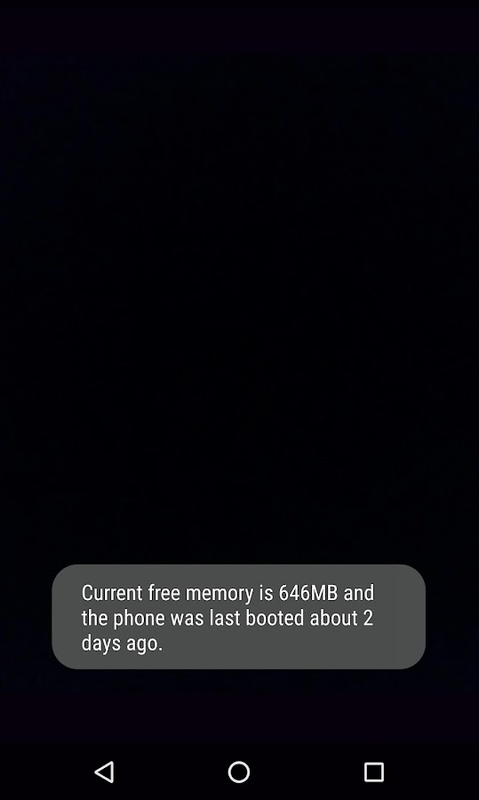 This is a very simple, completely free app which does only twothings: It indicates how much free RAM, or operating memory (asopposed to storage memory) you currently have available, and itindicates approximately how many days it has been since your phonewas last started up. Tap on its icon and the app briefly shows youthe information, and then closes automatically. If I run it, and Isee it's been more than about a week or so since I last started upmy phone, I generally reboot the phone when convenient. Why rebootafter a week? You may find, as I sometimes do, that your phone isstarting to slow down or behave inconsistently after beingcontinuously operated for more than a week. When certainapplications are closed, the RAM (operating memory) that they areusing may not be released reliably. If this happens a number oftimes, a general slowdown of the phone may be noticed. Restartingthe phone will normally completely resolve this situation.Note:FreeMemory-LastBoot will NOT reboot your phone. It simply showsavailable RAM and reminds you approximately when your phone waslast started up.No ads, no solicitations.Thanks to Pent, developerof Tasker. Clean My Android is a light phone cleaner, app manager for yourAndroid phones or tablet. Your android has become laggy andfreezes? Your battery has started draining quicker than ever? Yourphone overheats and needs to cool down? Clean My Android is thespeed booster you need! Change your device's speed from 🐢🐢🐢 to 🚀🚀🚀.It can smart clean background processes, stop stealthy runningapps. ★ Boost your apps and games, free up memory ★ If you don’tknow anything about clearing cache, tired of watching how yourphone gets slower every day, this is the best app that fast yourslow phone. You’ll not have to worry anymore about how to clearcache or how to speed up Android phone; our app will take care ofeverything, delete junk files, residual files and cache to free upstorage, improve the performance of your Android device. ★ Stopapps that waste lots of power in 1-tap. ★ If your Battery isDraining Quicker, your Device Become Laggy, Freezes All the Time& it Overheats when Running Apps; Our 1-Tap Boost make it easyto stop apps running in background. ★ Easy to Use ★ Very easy touse, we made it really simple. Just 1-tap the clean button andthat’s it! Our Apps will get the job done. Clean My AndroidHighlights: ☆ A single touch to speed up your devices from yourHomescreen. ☆ Fast, compact and efficient with low memory and CPUusage. ☆ Add frequently-used apps to your whitelist. ☆ ExtremelyPowerful Tool. ☆ Friendly User Interface. ☆ Only nedd 3MB,Low SpaceNeeded to Install. Feel free to contact us if you have any problemabout Clean My Android. Free—clean up system trash files (caches), extend SD card storage,and solve your lack of disk space. Plus free Speed Booster forAndroid Phones. Have you ever encountered the following problems?1. System garbage causes the phone to run slowly and app garbageeats up your internal storage. 2. No more space is available fornew photos or apps. 3. Your phone is running crazily slow. Allthese situations need a clean-up tool, such as a phone booster,junk remover, etc. Highlights of DU Cleaner (Boost & ClearCache): ► Ultra-small size Making it much smaller than similar appson Google Play. ► Extremely focused Performs the most comprehensivetrash-cleaning to save you more phone space; ► Intelligent analysisUsing our new intelligent analysis engine, DU Cleaner (Boost &Clear Cache) deletes what you want to remove, leaves what you thinkis useful, and never loses your good memories. Features of DUCleaner (Boost & Clear Cache): ► Clean Up & Junk FileCleaning The junk-creating behavior of millions of apps has beenanalyzed so that DU Cleaner (Boost & Clear Cache) canefficiently hone in on its targets (cache and residual files) withperfect accuracy. Delete cache and residual files to reclaimstorage, boost speed, and improve the performance of your deviceand SD card. ► Memory Boost Boost your games and apps, free upmemory (RAM), speed up your device, and save more battery. Our1-Tap Boost features make it easy to optimize directly from yourhomescreen. ► Useless APKs Find and delete useless APKs on yourphone to free up more storage space. ► Residual Files Clear upresidual data from previously uninstalled applications. The World'sMost Trusted Android Optimizer, Speed Booster, and trash-cleaningapp; DU Cleaner & Speed Booster is a FREE app that can helpclean redundant apps and files, free up storage space, clean upyour RAM, and speed up your Android device. Help fight againstdeceptive ads DU Group is dedicated to providing a safer mobileexperience for our global users, so we’re committed to fightingagainst misleading downloads. We’ve found that some ads might bemalicious promotions from unknown channels. If you come across oneof these ads, you can help us take them down. Please send the linkand screenshots of the ad to [email protected] We appreciateyour kind help. Get AVG Cleaner for Xperia now to save space, help boostperformance speed and optimize battery usage! ⚡ Clean junk files,bad photos and unwanted apps ⚡ Optimize and extend battery life ⚡Remove apps that consume too much mobile data ⚡ View all importantinfo about your device on one screen ⚡ Hibernate apps to improvedevice performance ⚡ Boost up speed by force stopping RAM guzzlingapps With PRO version you get: 💎 Battery Profiles - helps you usejust the resources you need when at home, work, on the go or whenbattery level is low 💎 No in-app ad display With AVG Cleaner forXperia you can monitor and clean junk files, bad photos andunwanted apps to make room for the stuff you really want and helpboost performance speed. Cache Cleaner: 👍 Clean unnecessary cachedmemory running in the background Photo Cleaner: 👍 Automaticallyidentify bad, similar and duplicate photos 👍 Review the photos youwant to keep * Your privacy is important to us! We don't store norshare any of your photos App Manager: 👍 Monitor and remove apps bystorage, RAM, battery or mobile data consumption 👍 Get weeklyalerts about rarely used apps and choose whether you keep them ornot Battery Saver and Optimizer: 👍 Save power by seeing whichresources are consuming battery life and switch off the ones youdon't need 👍 Use our Battery Profiles PRO feature to save batterypower and use only the resources you need by choosing between "LowBattery", "Home", "Work" and "Car" profiles AVG Cleaner for Xperiaruns automatic cleaning check-ups and lets you know when it's readyto go. This feature runs regular cleaning check-ups of your cache,history, files and photos and lets you know what else you cansafely remove. Just set it up to run at a frequency you prefer,depending on your usage level and available space. Tidy up yourphone and free up space to help it run quicker and boost up speed.Remove unwanted cache, bad photos and other unnecessary files tomake more storage space available for new photos, apps and anythingelse you want. Get AVG Cleaner for Xperia now for free! Byinstalling/updating this app, you agree that your use of it isgoverned by these terms: http://m.avg.com/terms This app usesAccessibility permission to assist disabled and other users stopall background apps with just one tap. Xperia™ is a trademark orregistered trademark of Sony Mobile Communications Inc.
Super Booster & RAM Cleaner - New and FREE Phone Speedupapplication for Android. The software frees the memory to optimizethe ram and speed up the phone with one touch. Phone Booster &Booster is a free Android app that cleans up RAM and manages phoneapplications. It helps you to increase your phone memory and extendyour phone's battery life. When you use your phone for long periodsof time and you often experience a slow, lag-busting situation onyour Android devices, you have to reboot your phone to get yourphone running faster. With Speed ​​Booster you will not have fearof slow or lag after a period of use. Phone cleaner and acceleratorwill make your phone run smoother and faster by freeing up phonememory.Speed ​​Booster will help your phone optimize CPU, RAM andmemory, help speed up the phone faster and free up the ram memoryto increase the ram memory. It frees up and increases the amount ofram available for your device to boost the ram for android, makingyour phone run faster and more stable.The mechanism of operation ofSuper Booster is that it will monitor the process, the applicationrunning underground on your phone. And when it detects that yourdevice is using excessive RAM, Super Booster & RAM Cleanerautomatically closes unnecessary applications that are not neededto improve the performance of your device.Especially for gamers,the Gamer Booster + feature is indispensable on your phone. GamerBooster + accelerates and optimizes games for a great gamingexperience. Download the application to remove the ram right touse.Not only helps speed up the android phone, but Super Boosterwith "Application Management" helps the manager of games,applications on his phone. Especially, this feature also suggeststo users the applications that can be "disabled" to increase theefficiency of the phone to help speed phone calls fast.Functions:-Free up 50% more memory than most similar applications- Forcingclosing of memory consumption on unused applications, frees morememory to speed up mobile devices, more stable.- Close applicationsrunning underground to cool the phone- Supports applicationoptimization, game acceleration- Supports ram testing, rammanagement- Help me to love my battery- Intelligent applicationmanagement- One touch to accelerate and transform complexactivities becomes simple and effective;- Booster + makes smartacceleration.- Free (with ads)Download the phone speeding softwareon your phone to use and evaluate the 5 * Super Booster & RAMCleaner application to support your developer.